There been a lot of banter about Almost Real for the last little bit. The team keeps a slow pace with their assortment of select releases. And fans of the brand keep shouting for more! 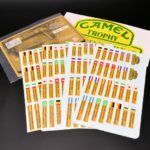 Patience in this hobby is a good thing, it allows one to save and direct monies on other important priorities. 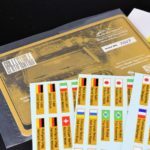 As you all know today a good quality diecast will set you back north of $250. 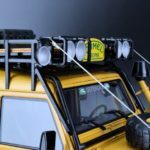 Almost Real’s focus as of late has been SUVs in 1:18 scale. There was a hi-cup in-between, we saw the Bentley Continental GT3-R in a number of exterior colours, this is one we already reviewed here in detail – click the ‘Reviews’ link above to see more. 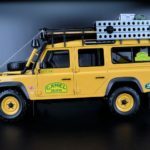 The team was gracious enough to forward us a sample of their latest release, the 1:18 Land Rover Defender 110 “Camel Trophy” Edition. 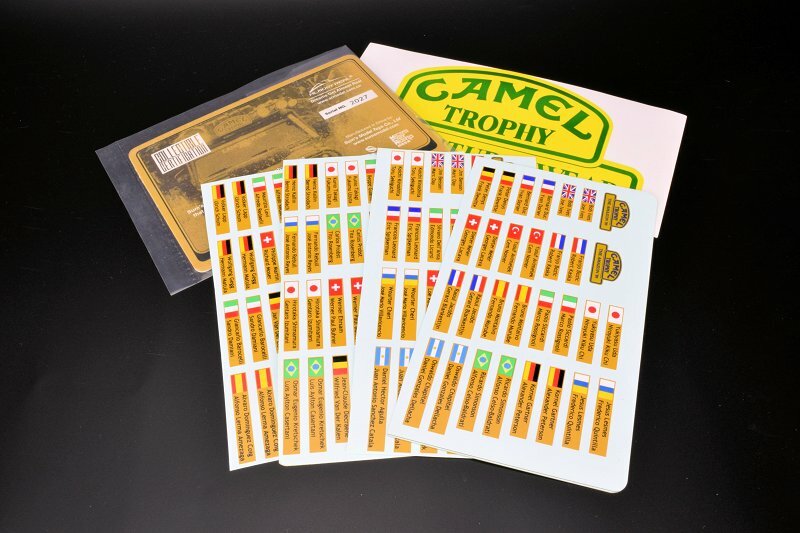 We don’t know much of the history of The Camel Trophy but from what we gather it was a vehicle-oriented around competition that was held annually between 1980 and 2000. 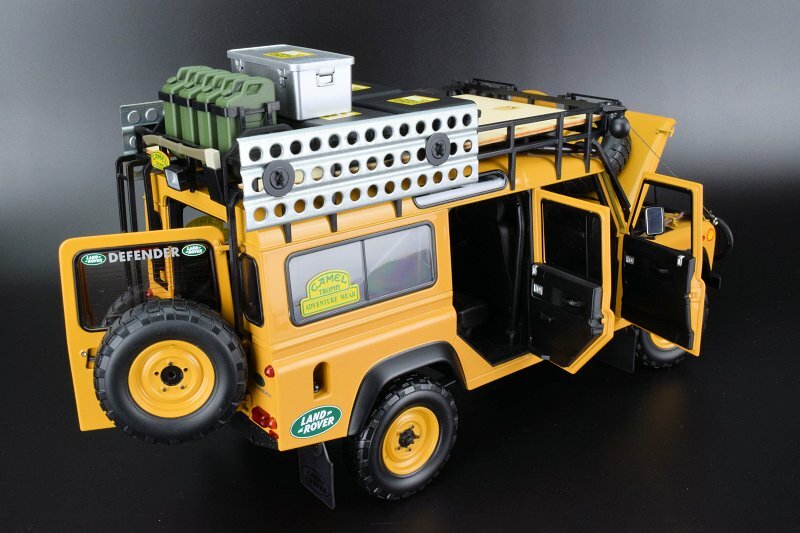 Land Rovers, in general, excelled here, hence the model in scale. 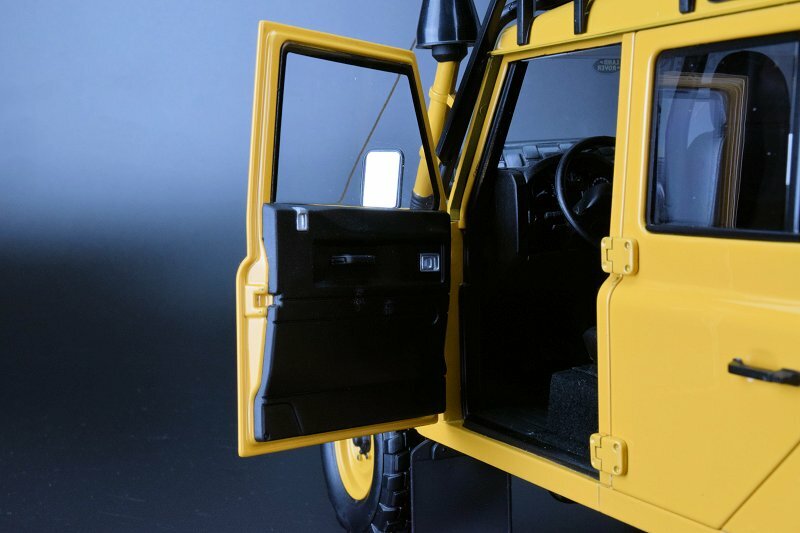 Inside the box, Almost Real includes a host of accessories which do amp the realism factor a few notches. 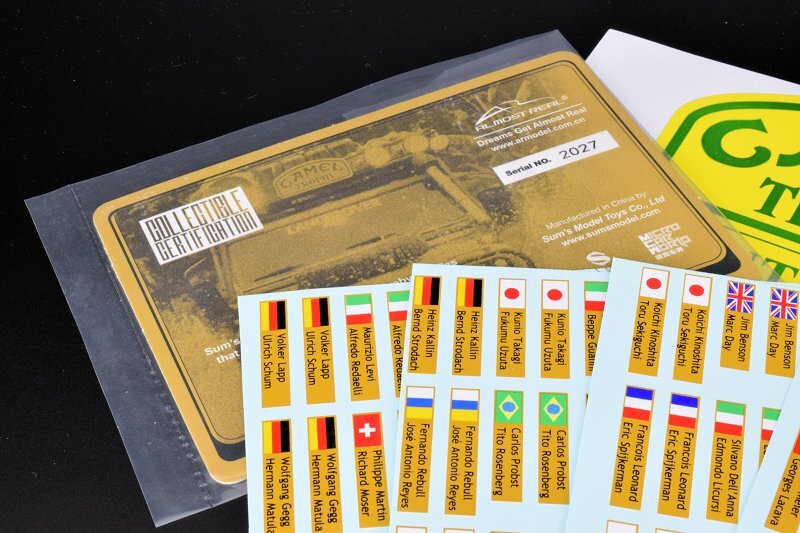 Multiple sheets of decals are provided. They feature teams from various parts of the globe. 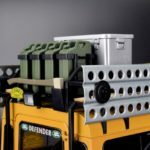 The fun doesn’t stop here, four Black storage cases, one large Silver storage box along with four gas cans round out the larger accessories. In addition to the tools that are already affixed (they are uber cool BTW) to the front hood, the continued arsenal comes in the form of a large axe and rope with a metal hook on each end. 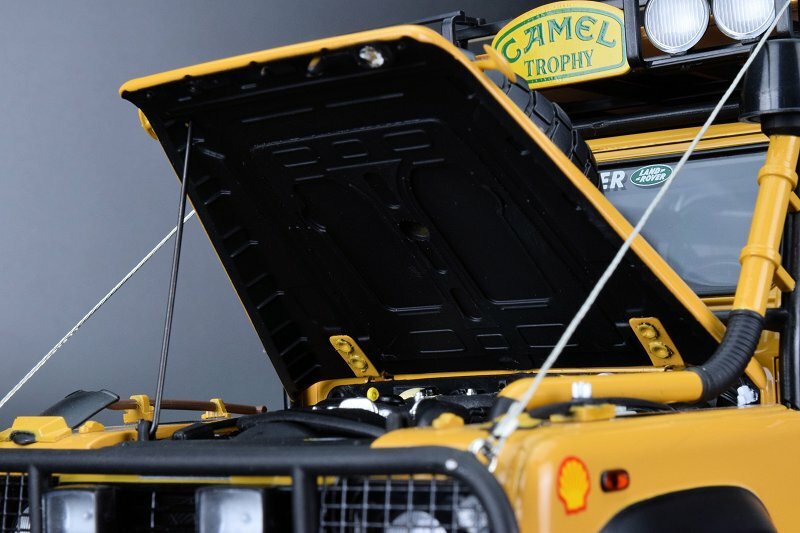 Basically, there is an enough here to load up and go on your own Camel Trophy adventure! 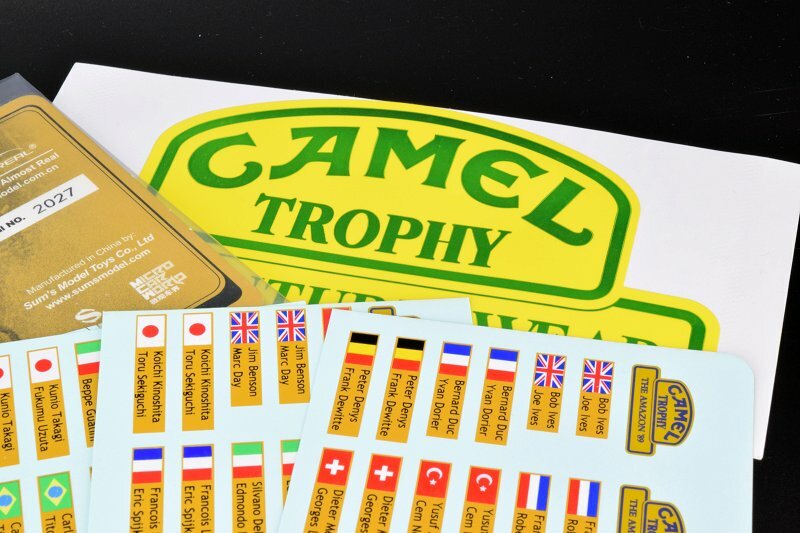 And if that wasn’t enough Almost Real provides a certificate of authenticity and as well very large Camel Trophy decal to boot. They call it the “Gift”. 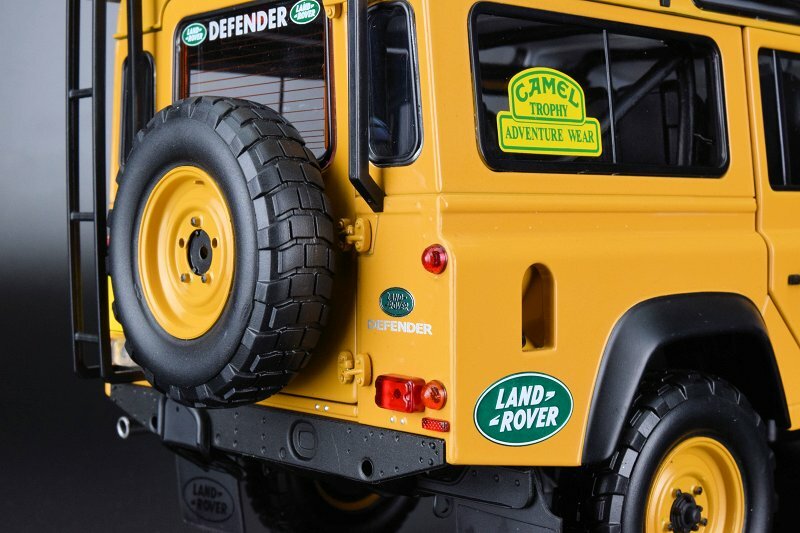 The exterior views of the Land Rover Defender 110 “Camel Trophy” Edition are just majestic. No matter the angle the model looks all business, there is something new you discover upon a second or third glance. Exterior paint work is excellent throughout; consistency is definitely the name of the game. There are so many variants of the particular model one doesn’t know which or what was the actual model specimen. 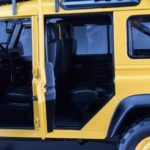 From what we gather the overall design of the Land Rover Defender 110 is here and done extremely well, however, from a purists perspective, there are some not so obvious misses that I will get into detail later on. 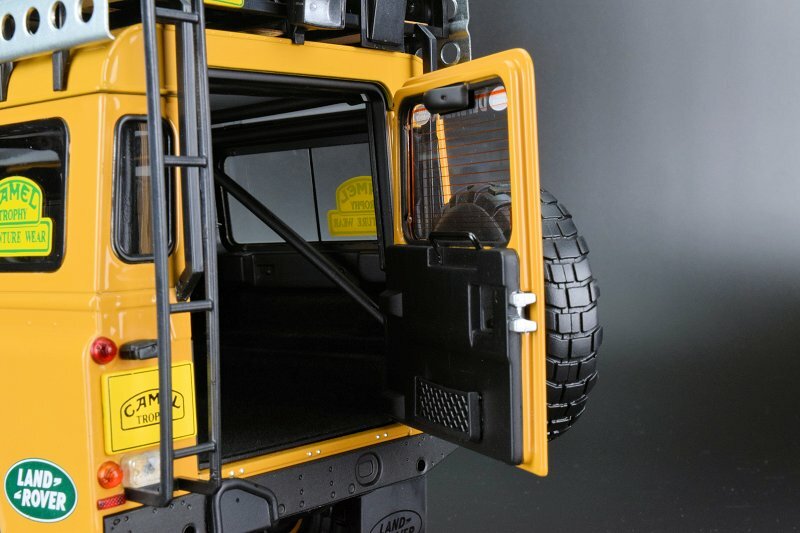 Exterior shutlines and panel gaps on this particular piece are excellent. Fit and finish on the exterior are completed well. 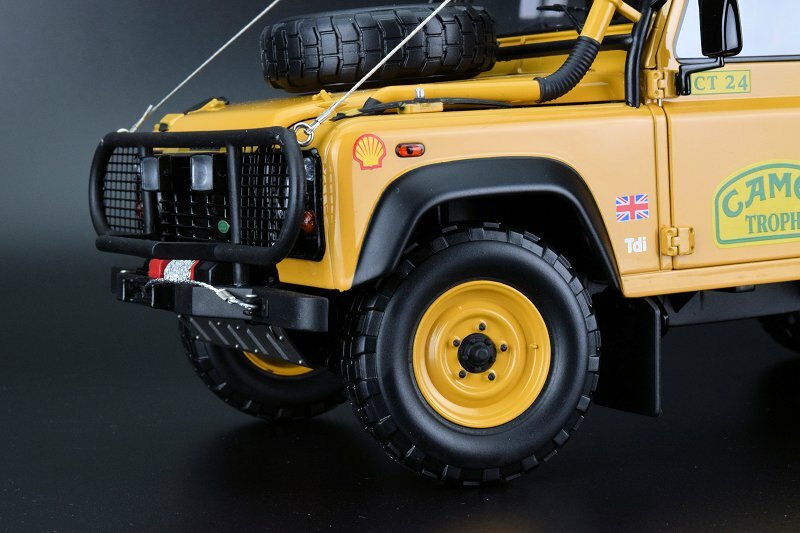 The diecast metal shell does provide the rigidity and finish elegance of yesterday. It is nice to see some manufacturers still embracing the material in full scale. 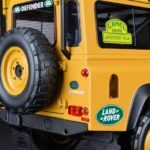 What decal work is factory installed is executed well with quality material. 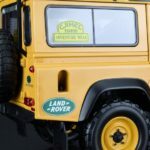 However, from a purists perspective, the decals on the windows aren’t period correct. 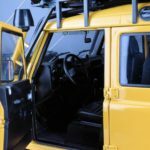 We’re not an authority on Land Rover or Camel Trophy, knowledge was gained via conservations we had with various fan club members. 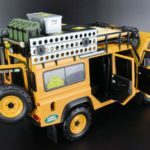 Moving to the front of the model you will notice an array of goodies. Quality craftsmanship is apparent throughout. 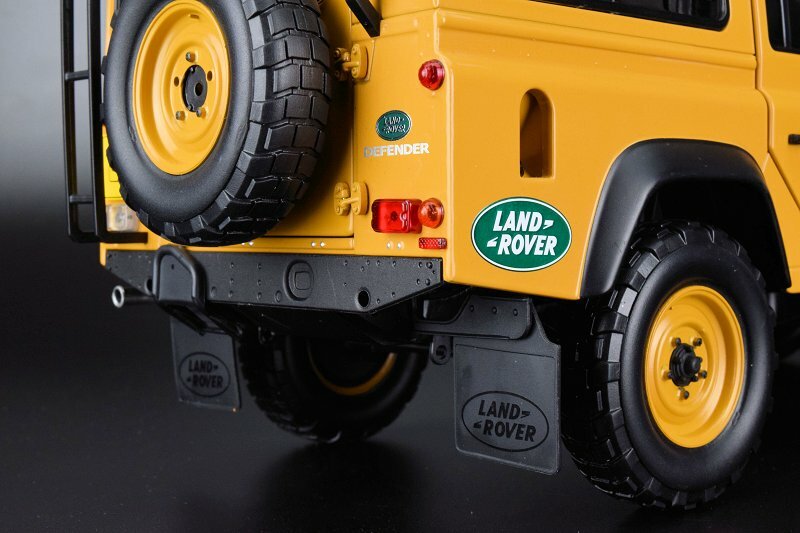 As mentioned earlier you will see the tools affixed to the upper fender area, they are static and not removable. The spare tire is present. The engine compartment does provide access more on this very soon! Note the metal defector just under the bumper. Beautiful! 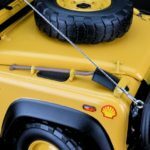 The fascia is mated with a large protective grille (made of plastic) and bumper with winch. 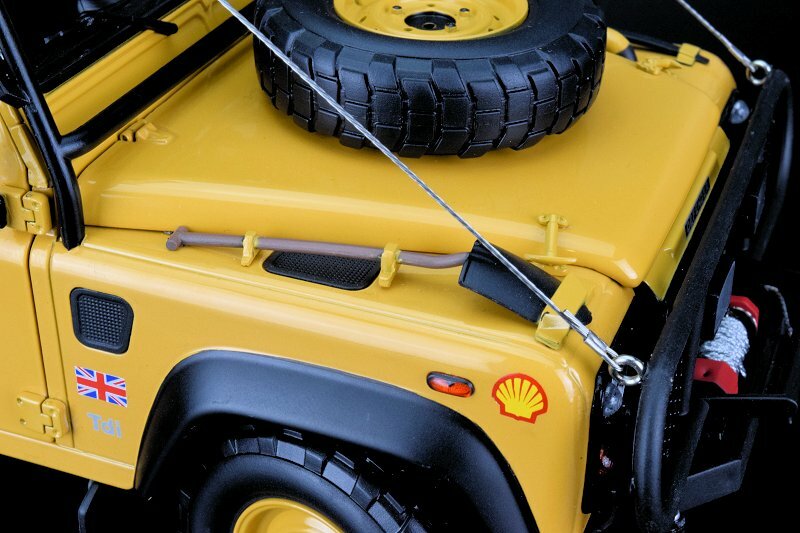 Note the toes hooks on either side of the bumper with metal pins; very cool. 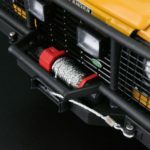 As for the winch, it doesn’t fully operate, though the line is functional up to a certain point and locked into the toe hook driver side. 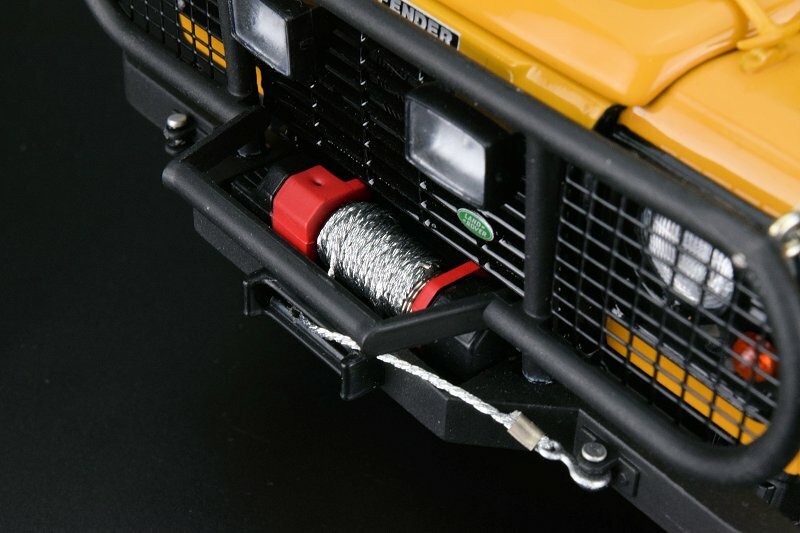 The winch itself is not period correct, what is shown here Husky Superwinch (installed since 1991), but to be period correct it would need to be a Warn Winch. Headlights and side signal lights are too executed with quality materials; however, the integrated fogs are slightly less defined. 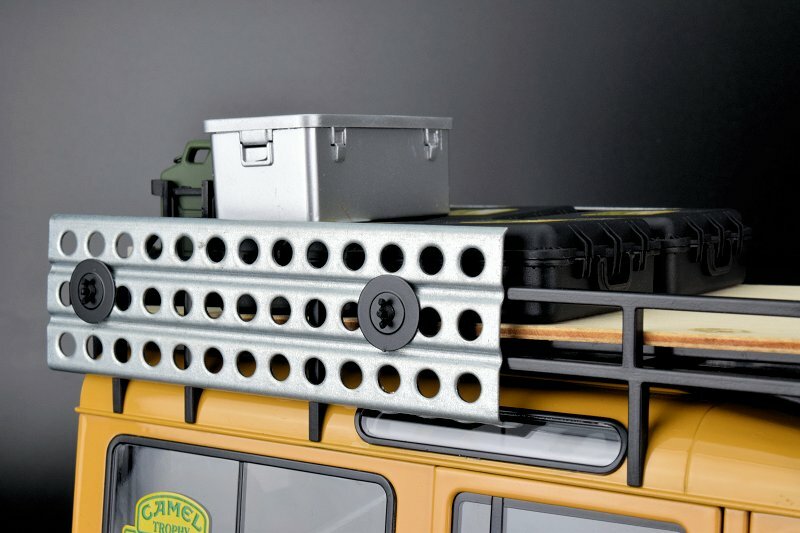 Note the uber cool detail in the metal-braided lines that lead from the massive grille to the upper storage rack. 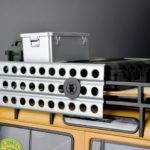 The rack work itself is crafted in heavy plastic. 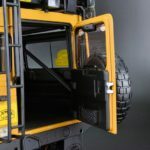 In our opinion, it is executed very well as for the fit and finish but the overall look is a little too “plastic” looking based on the level of execution of the other components of the model. 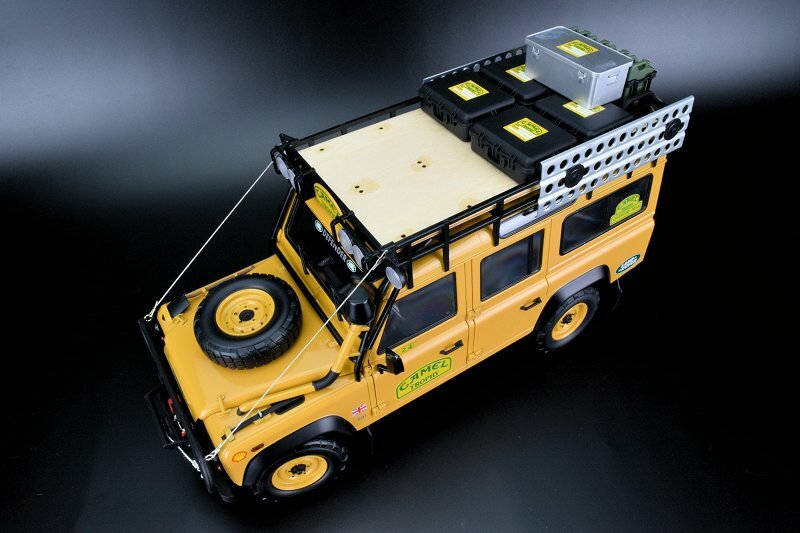 For the storage rack Almost Real provides the end-user with real authentic wood base/bottom liner. Installation here is a breeze and fit and finish is top notch. 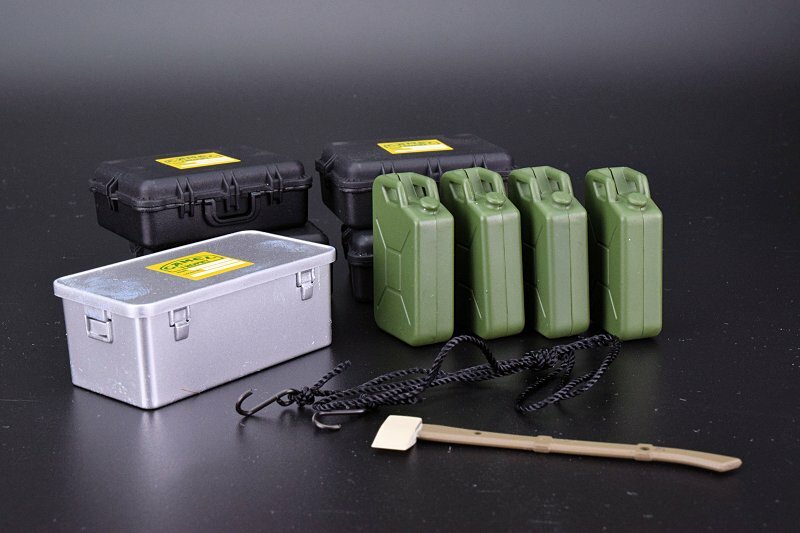 You can see there are compartmentalize areas for gas cans. 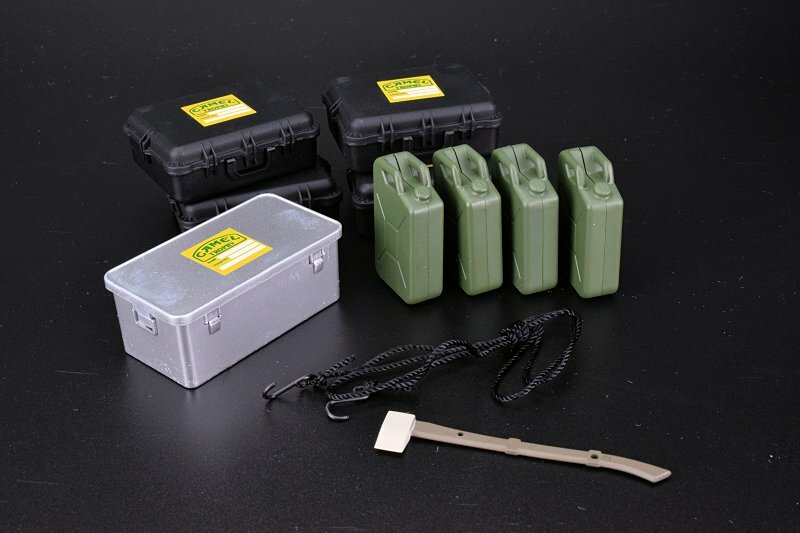 The remainder of the accessories and be placed at will. Metal sand tracks are fitted to each side, neither can be removed, a shame. 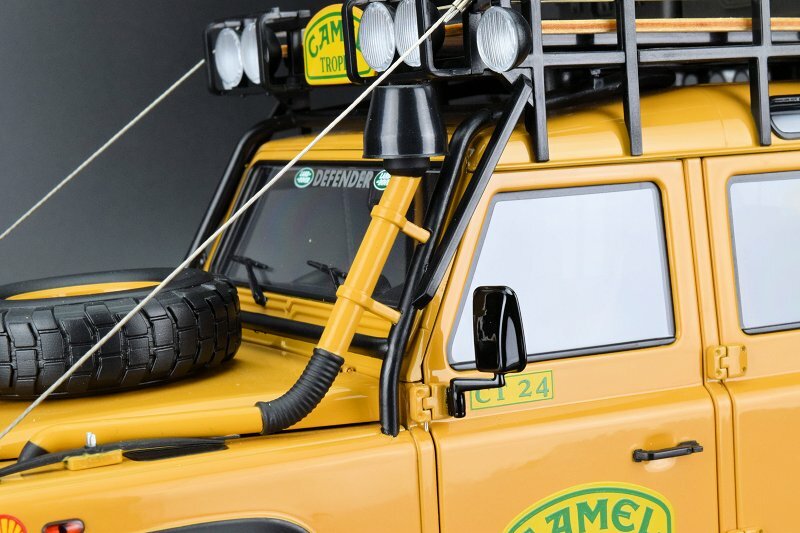 As for the sand tracks, once again these are not period correct, in true likeness they would have integrated teeth on the long side of the perimeter. Funny though, most photos you review you see similar vehicles fitted as provided by Almost Real. 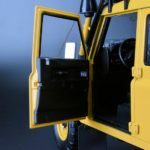 The rear of the Land Rover Defender 110 does have a functional door. Love the beefy and authentic three hinge design, operation here flawless on our example. 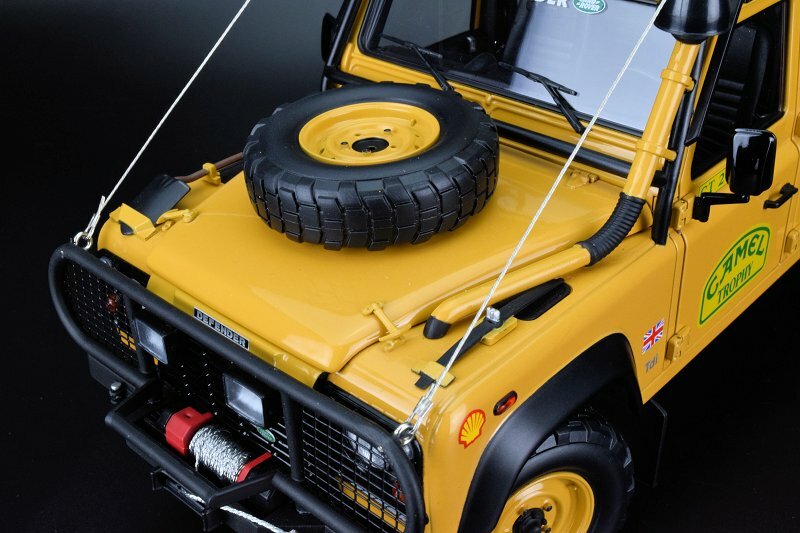 Note, the spare tire isn’t period correct, this is more in line with a modern Land Rover. 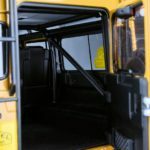 Inside the rear section is fully carpeted in Black with a roll cage that extends to just behind the front seats. 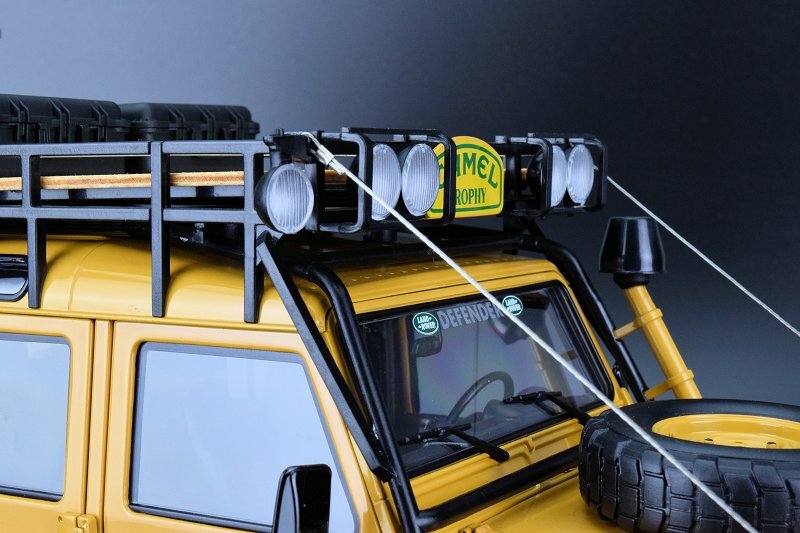 Taillight and various other lighting elements are crafted again with precision and quality materials. The engine is fully accessible. Hood operation on our example works without issue. 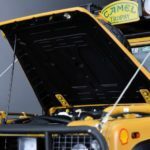 Do note the two clamps are not functional on the exterior side of the hood, but workmanship or each clamp is definitely quality. The team secretly hides and small magnet in the hood to keep her safe. Thumbs up for the overall detail of the motor. The use of layers, colour and textures provide the realism we collector’s graves. Prop-rod is available and locks into an open and closed position. On the flip side, thumbs down to Almost Real for not using the correct motor. 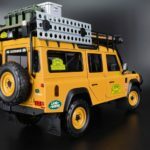 Seems they re-issued the motor from the last Defender. All four wheels spin and the front two steer. 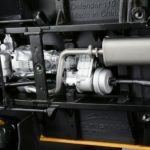 There are a number of workining compoenents that make-up the steering instrument. Wheels are executed well. We like the definition of the lug nuts and air nozzle. Braking components are visible from the back section as well. 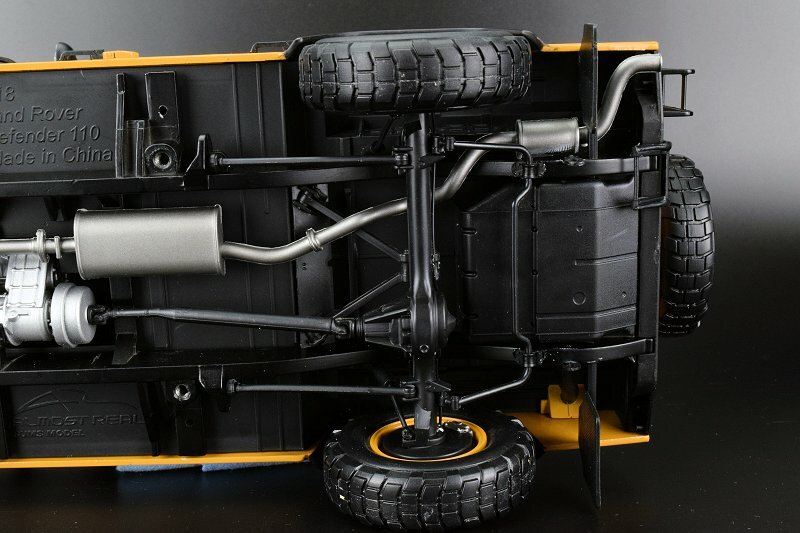 As we take a closser look underneath the model you can see a plethora of detail. 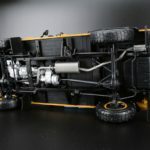 The model is equipped with independent and working suspension. 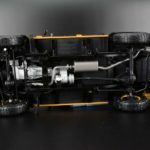 How cool are the metal springs and rear struts! 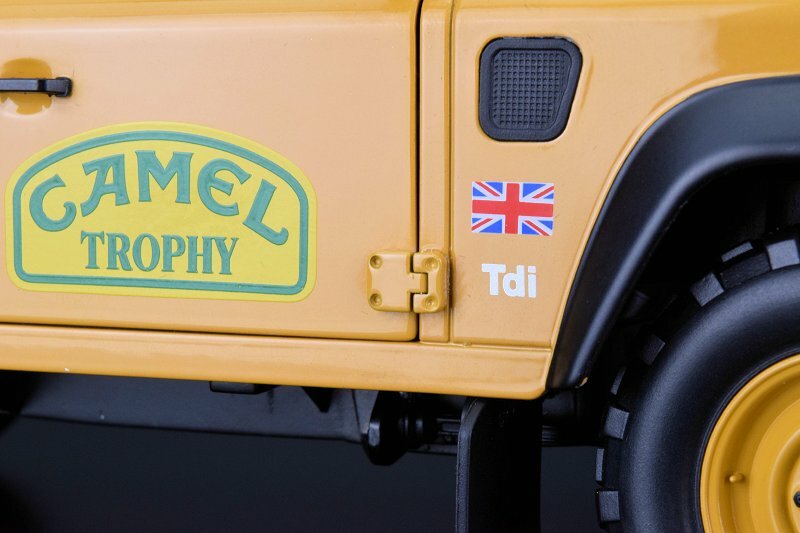 Note the defined exhaust, transmission and centre differential. 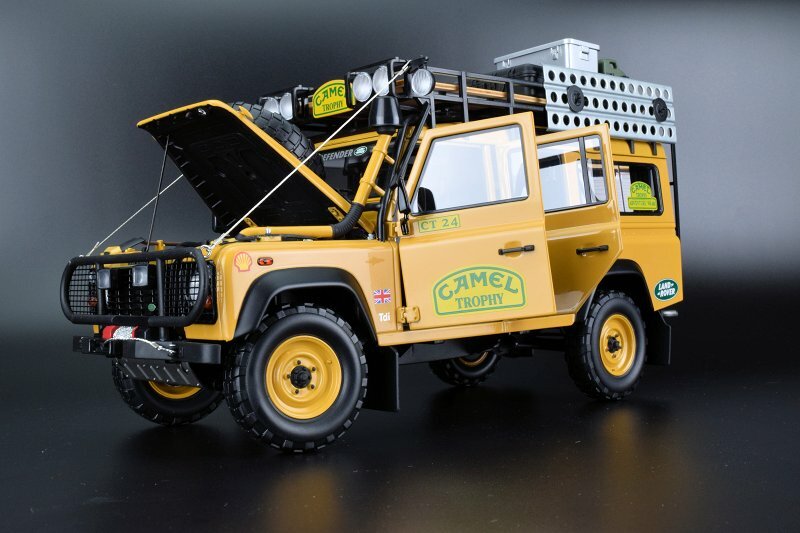 One thing I did notice, the Camel Trophy isn’t on par as their earlier release of the 1970 Land Rover, Range Rover. Most undercarriage instruments were metal and fully functional. Meaning as you turned the wheels the diff apparatus would be in full swing as well. 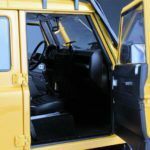 Interior is fully accessible via the four doors. Love the quality hinge work here! 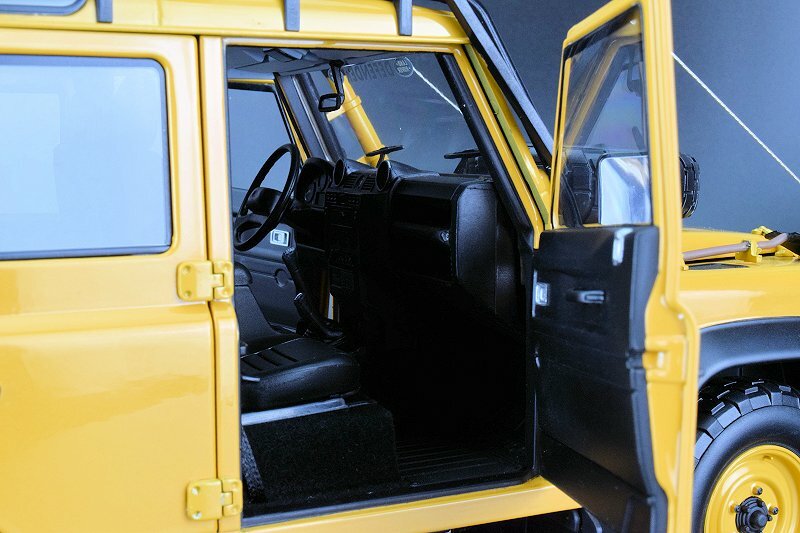 Our example did arrive with the rear passenger door open and pin in the upper hinge missing. Thankfully it was found within the packaging and re-installation was a breeze. Seems the shipping tape from the factory gave way. We did send a note to Almost Real to beef up the tape on future releases. 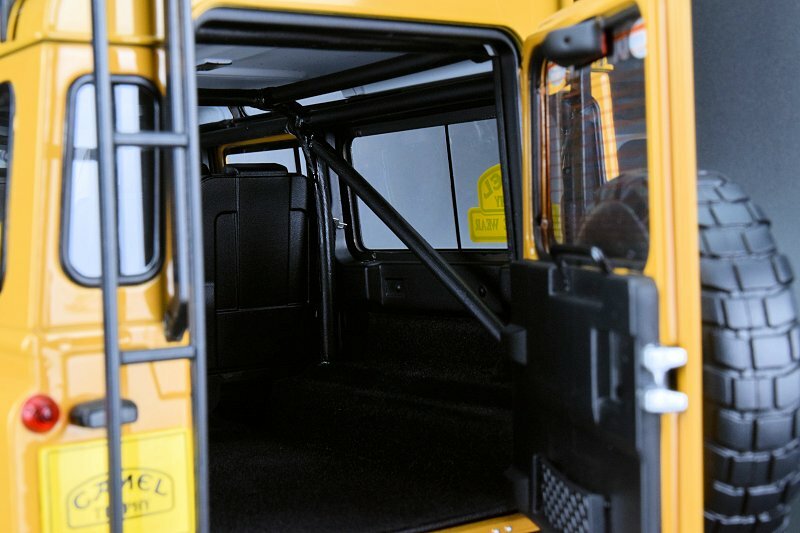 The interior is completed in all Black. Carpeting is found through and well as the rubber matting. 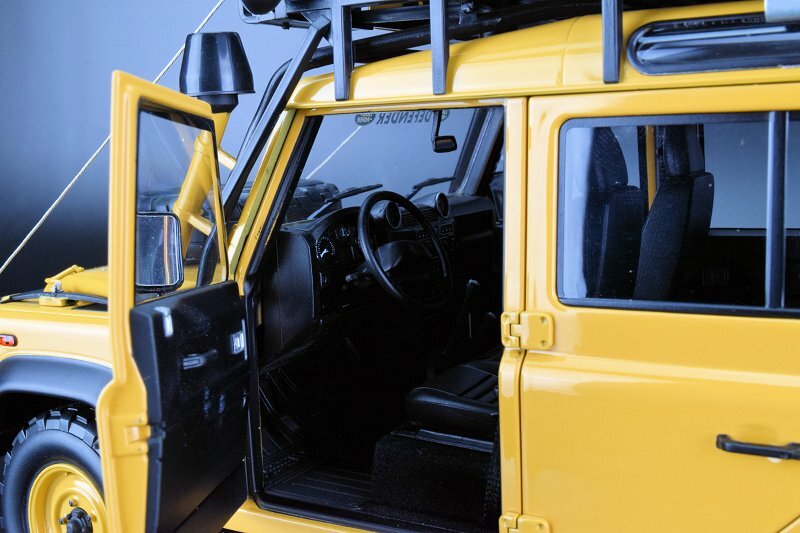 Dash, centre console, and doors cards all present well and definition is good. 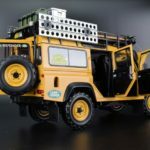 The miss here the team re-used the interior of the Heritage Defender 110s, which are powered by the Ford Puma TDCi engines, and not the actual interior of a 200Tdi Defender. From a purist perspective, this would be a big no-no. 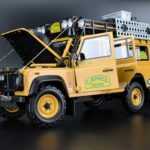 The Almost Real Land Rover Defender 110 “Camel Trophy” Edition is an exceptional model, no doubt. 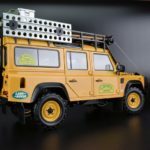 Based on the current buzz and our DiecastSociety.com 2018 Model Of The Year potential candidate list she is getting many nodes from collectors across the globe. The photos don’t lie she does present well, execution is solid throughout and the list world-class character bits is long. The addition of the added gift is a nice touch too. 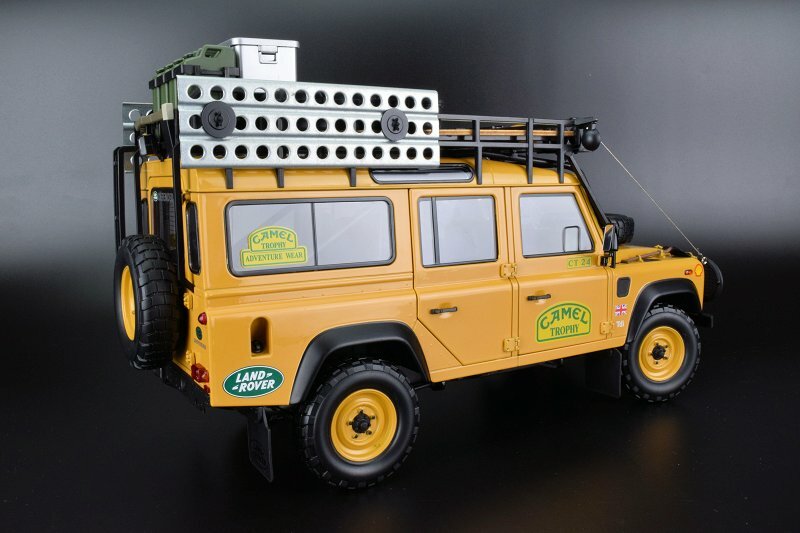 What Almost Real does right is excel on the realism factor, bringing us back to the finer days of diecast metal scale models. 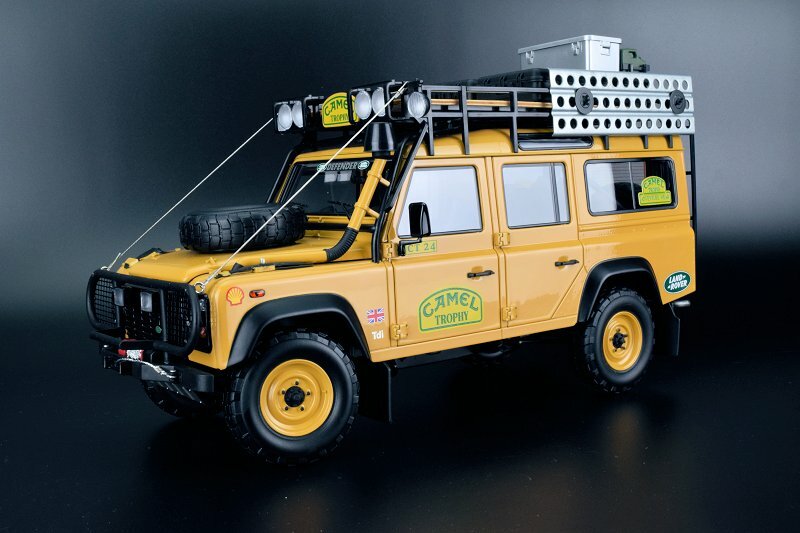 On the other hand, it does fail from a purist’s perspective; the wrong motor and interior are hard to swallow… The Land Rover Defender 110 “Camel Trophy” Edition does come recommended, but I/we are not a Land Rover Defender 110 Camel Trophy purists at heart. Enjoy the pics! 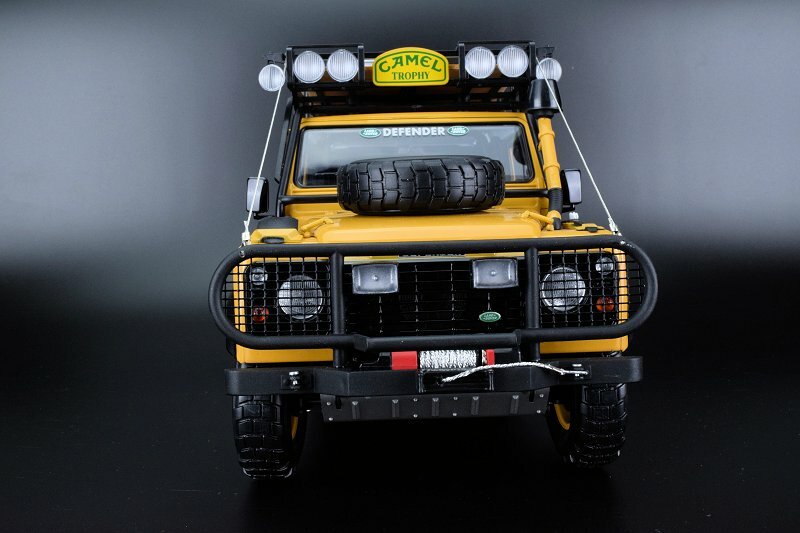 19 Responses to "REVIEW: Almost Real Land Rover Defender 110 “Camel Trophy”"
Best Model of the year 2018 (IMO) Looking forward to catch it around 150€ like the Range Rover classic I bought.. It will definitely be on the final list for DS Model Of The Year! 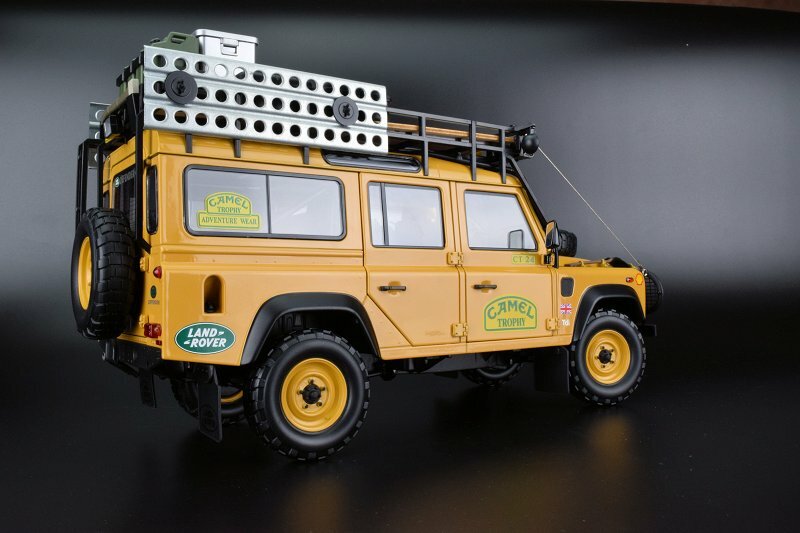 With such excellent die-cast models like this, why would somebody want to buy the composhite ones? 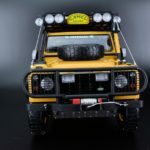 I’m really looking forward to further 1:18 models produced by Almost Real. They seemed to prove they do have intention to produce really good models and they do listen to customer’s comments and opinions. It is worth collector’s appreciation and support and warms up the interest to the future releases! True, but it would come down to priority level and price. This model is over $299 (plus tax) in Canada. Me, because there isn´t better option.. 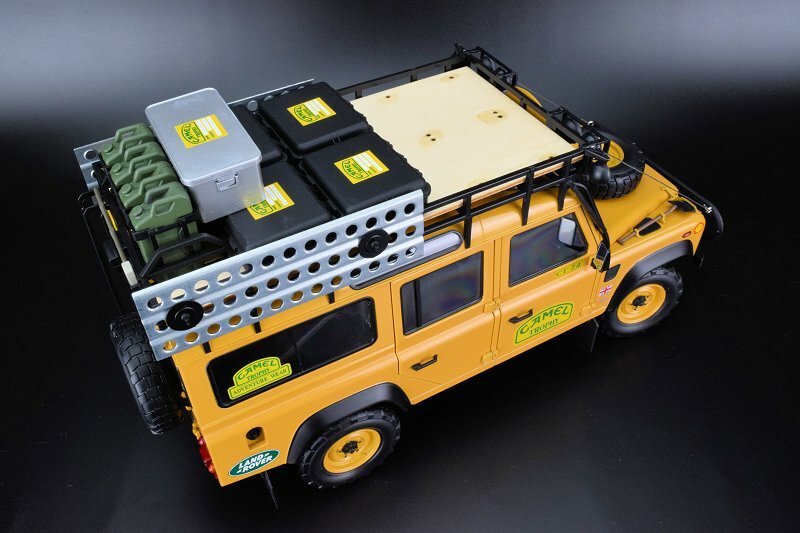 Examples 570s, 911 GT3RS, Lamborghini models etc.. no other with same details, paint, and openings, I hate their weight, but in the shelf is not a problem..
AMR AMG GTR, AMR G500 4X4 2, BMC JINMY, etc.. 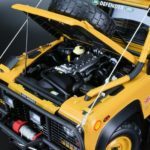 But Sealed Kyosho´s or Minichamps are not welcome, so, it´s a problem of the market, not of Autoart..
AMR is giving fresh air to the hobby.. and for me, as a Ferrari collector in Bburago time, is one of the little things why I don´t leave the hobby.. 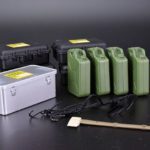 But the Hobby got a big problem, less quality in general despite this brand, and prices are rising without top…. For me is time to pick no more than 5 models per year, and keep money for Ferrari in the future, maybe 5 years, maybe 10? Nobody knows.. 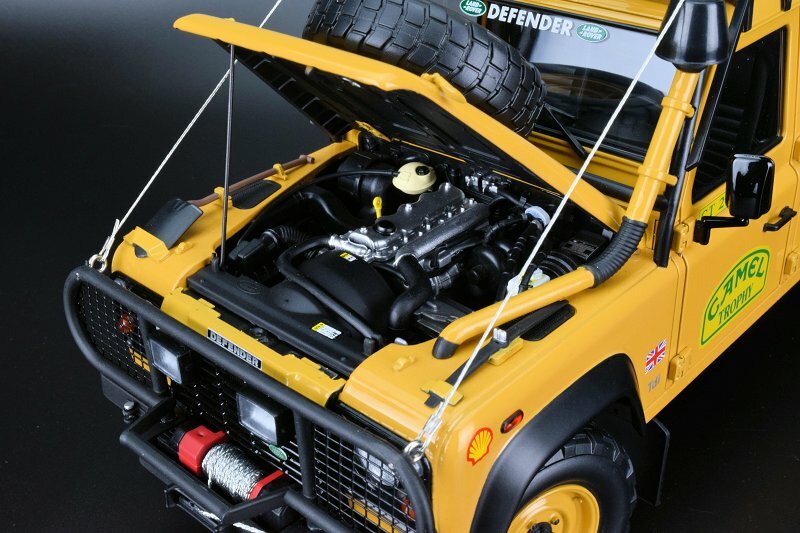 Being an owner of one of these masterpieces, while I do agree with you on the interior being reused from the Ford Puma TDCi-powered Defenders (probably taken from the Heritage 110 Defender) with the dashboard instruments and 6-speed manual shifter, I disagree with you on the engine. 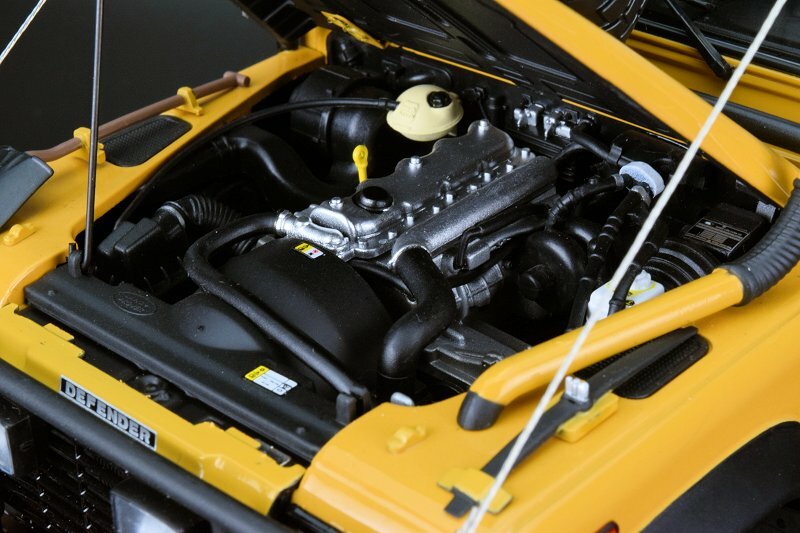 The engine bay, for the most part, is correctly modelled after the 200Tdi engine. 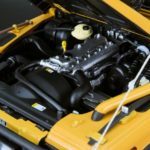 The wrong part is the engine cooling fan “bulge” at the front of the bay, not the engine block itself, and other components. 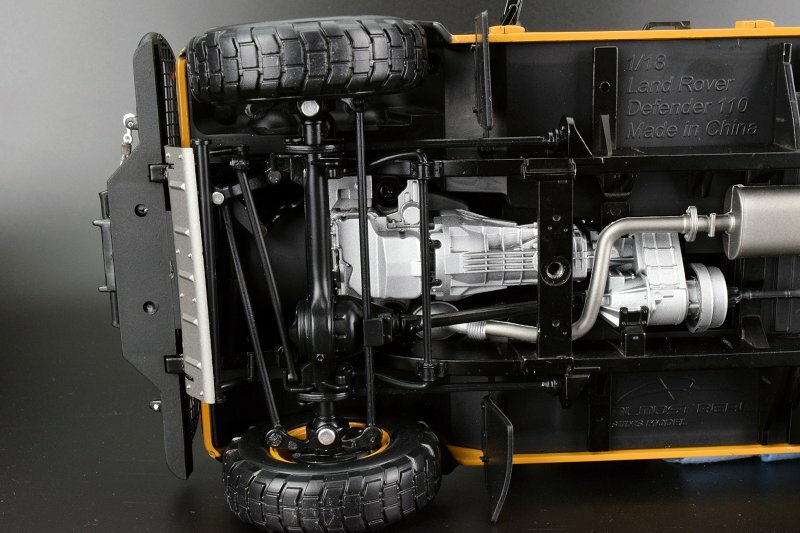 You can even look at other Puma Defenders made by Almost Real, and see that they have a differently modelled engine bay, correctly after those of real life Puma TDCi Defenders. One thing you did not mention however, was the wrong underside. 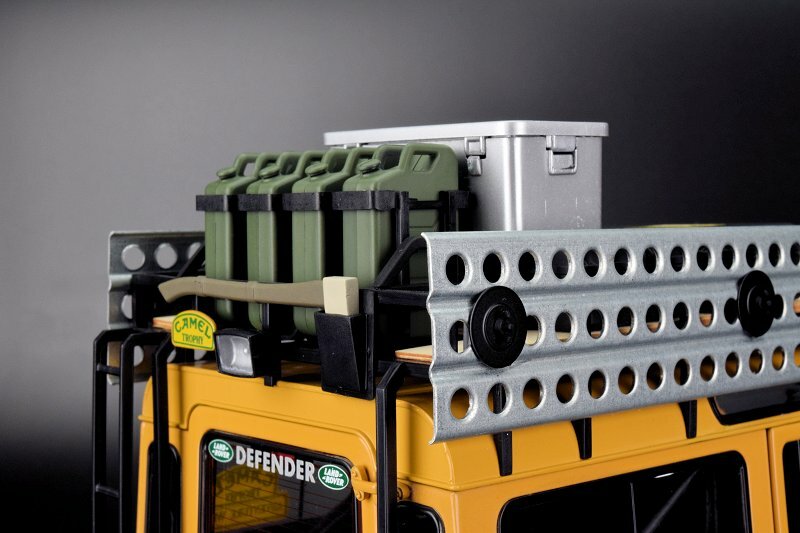 The underside, just like the interior, are reused from the Puma Defenders. 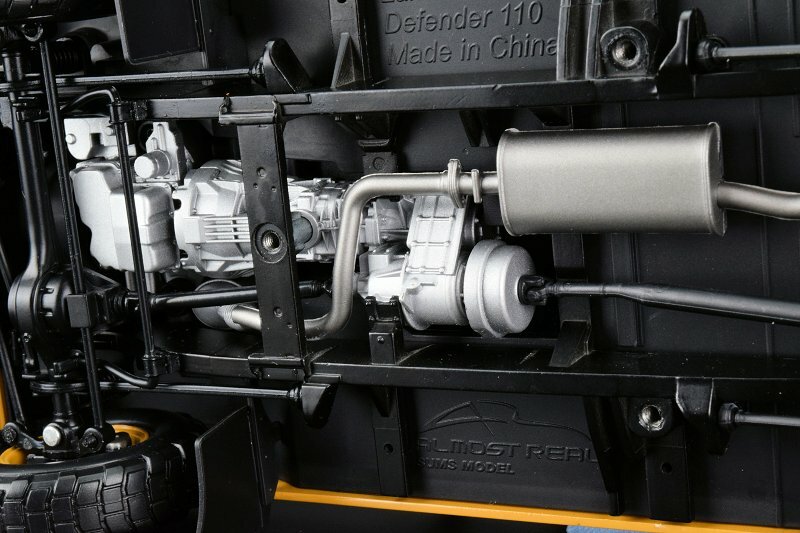 The oilpan (of the Puma TDCi) and MT82 6-speed transmission are the indications of reused underside. 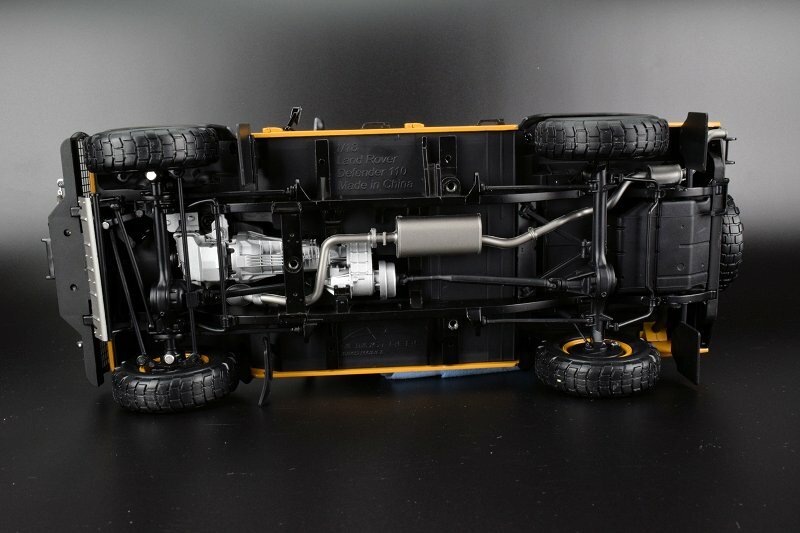 Look at the underside of the Puma Defenders made by Almost Real to see the identicalities. Thanks for the input from an actual owner of the real vehicle. Agreed. Thanks for the insight. @Karsten + DS Team: What? No! Haha, I meant “as an owner of the model”, not the real vehicle. Man, I’m not that lucky. I got to drive both the 110 200Tdi and 110 Puma, though both of them aren’t mine. 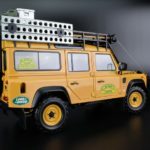 Obviously not ideal for highway or city cruising, especially with the 200Tdi, but once taken off-road, once again, especially with the 200Tdi, you will see why these vehicles’ production line survived for 67 years. 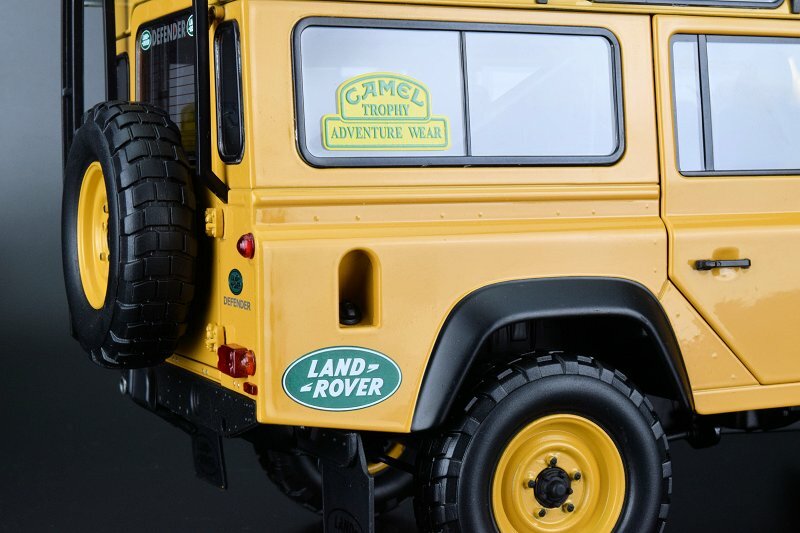 However, I’m lucky enough that I had the opportunity to see one Camel Trophy Defender 110 200Tdi up-close. I can tell you, Almost Real has (generally) hit the home run with this model. 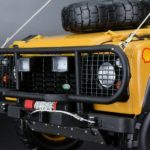 _ The winch should be correct, considering the 200Tdi Defender started production from 1990 onwards, and the Husky winch was also used on the real example I saw. 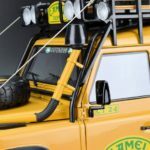 _ I’m not sure about the 2 large “Camel Trophy” decals on the rear windows, admittedly however, aren’t present on the example. _ The sand tracks also lack the “teeth” on the horizontal edges like the reviewer said, and the example also have them installed. 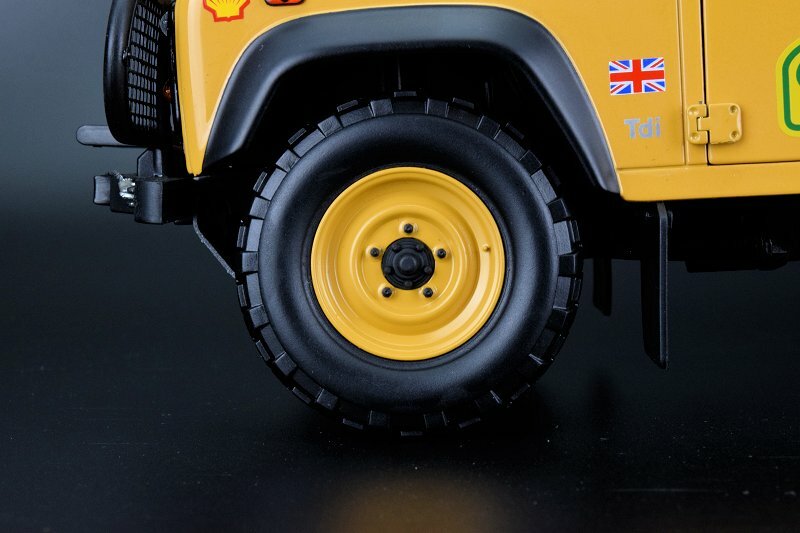 _ The example also has no rear spare tire. 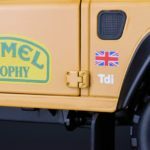 _ As mentioned, since the underside was reused from the 110 Heritage, the rear differential is a P38 differential by (Land) Rover, used for later Td5 and Puma Defenders, not a Salisbury differential used by the Tdi Defenders. The smaller size and different differential covers are indications. 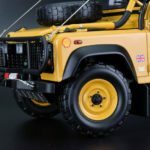 All models used (Land) Rover front differential. _ One hilarious mistake/luck(? ): Unlike the rear differential, the rear brakes on the model are correctly drum brakes. 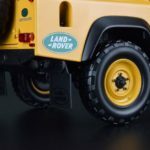 Since 1994 (or since the 300Tdi), all Defenders switched to rear disk brakes. 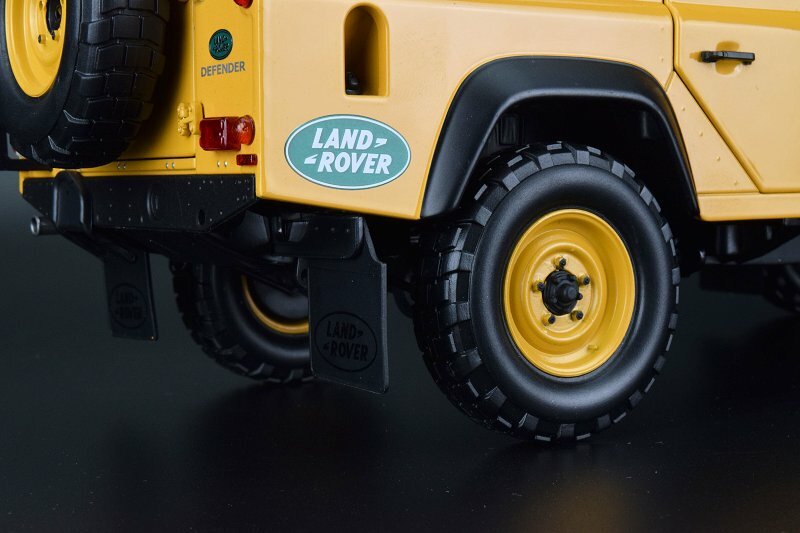 However, once again, due to the reused underside from the (Almost Real) Defender 110 Heritage, the drum brakes are present on the Heritage, instead of correct disk brakes. 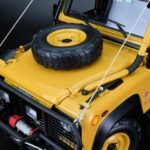 The (Almost Real) Defender 90 Heritage doesn’t have this mistake, and disk brakes are correctly installed. 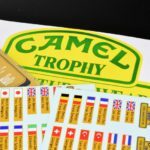 Some serious “long-term planning” for the Camel Trophy huh, Almost Real? 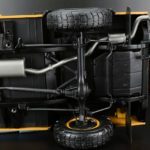 _ Like the reviewer said, and unlike the 1970 Range Rover and G500 4×42 by Almost Real, this model has no working driveshafts. 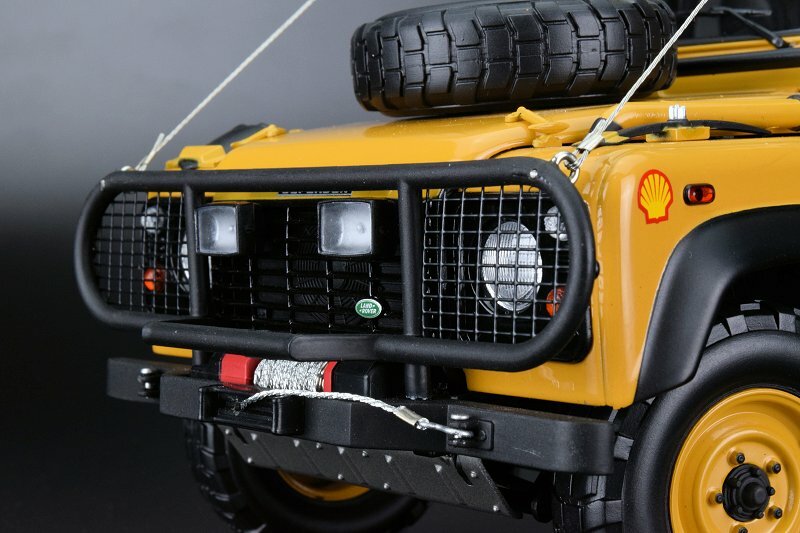 This is a pretty subjective factor for me, and I don’t consider this as a downgrade since we also have to take into account the reused parts from the Heritage, which was released way before the Range Rover and G500 4×42. 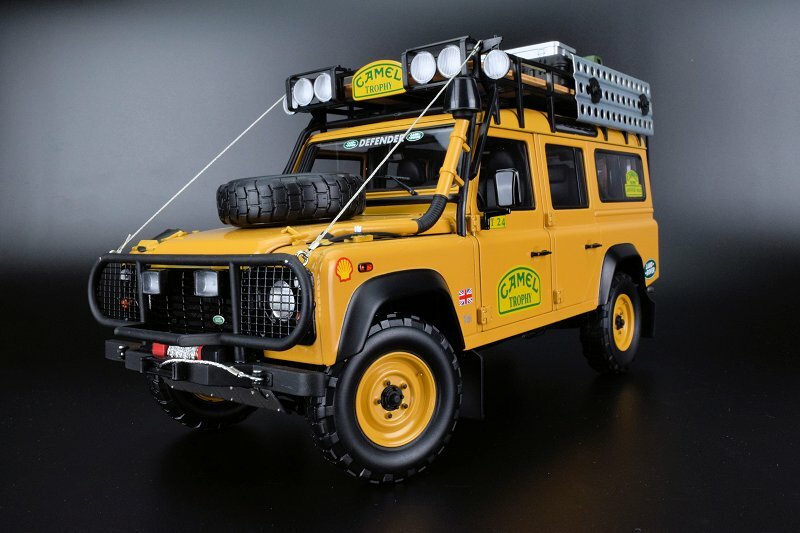 _ Almost Real used Michelin XCL tires for the model instead of the more usually-seen BF Goodrich Mud Terrain T/A tires. 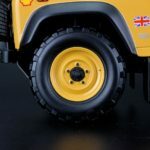 We don’t see these tires very often, and I’m glad they’re on the model, despite my personal preference for the BF Goodrich tires. Hope these points give you some more insight. 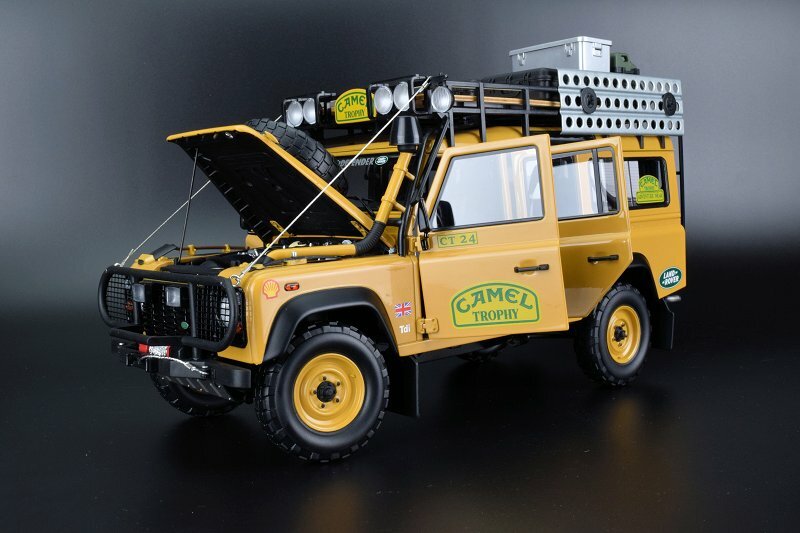 I’m not so sure about the “Camel Trophy” features, because I only saw one example. 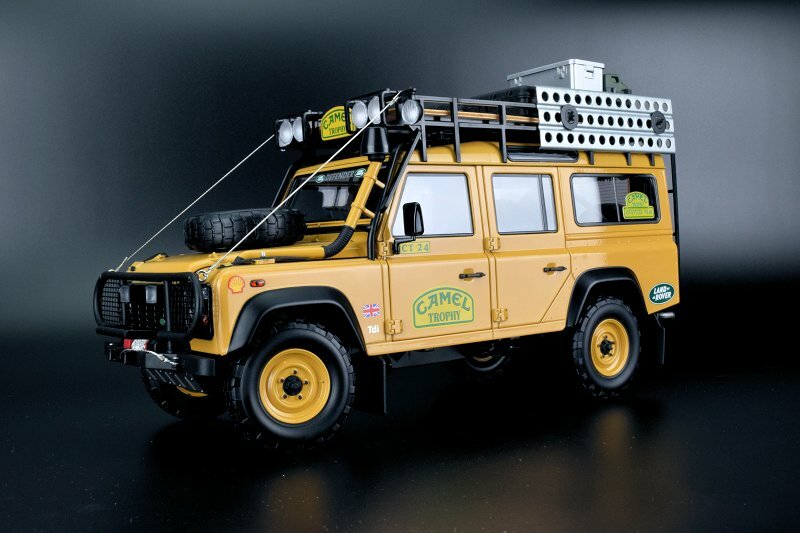 However, I’m sure about the mechanical factors (engines, brakes…) between the model and the real thing. 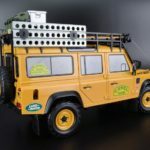 @Andrew: I don’t consider this an ideal model. In fact, I don’t think there is one, and I’m sure there are others who’ll agree with me, because this also takes in subjective matters. 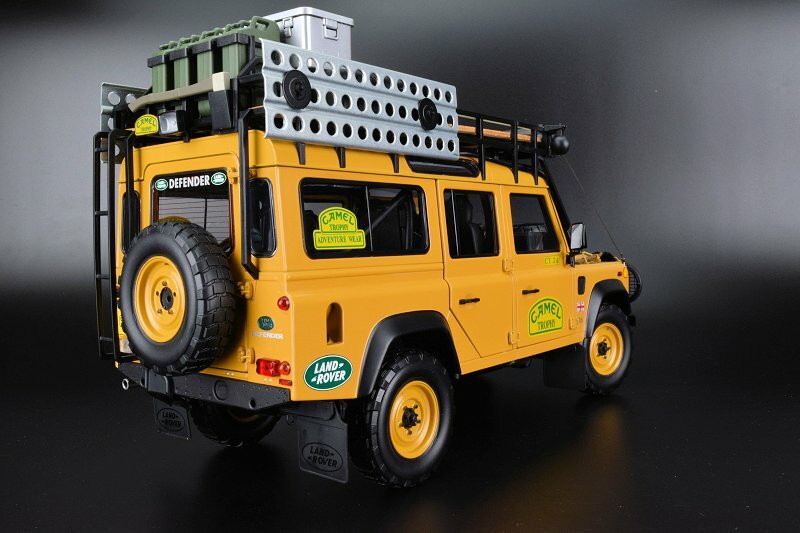 However, calling this model a “toy by Bburago” is completely exaggerated and ridiculous. 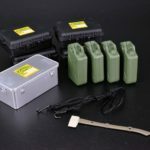 While Bburago is still very much Bburago, and they don’t have any model whic interests me, their quality has improved noticably since maybe the last 3 – 4 years. And mistakes are inevitable, and WILL happen to ANY brand, if the R&D aren’t done correctly. 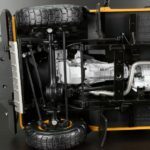 There are many mistakes on AUTOart models that are too obvious, and they don’t even fix them, even on later batches of the same model. If you think I’m over-reacting, look at the above section of my reply. 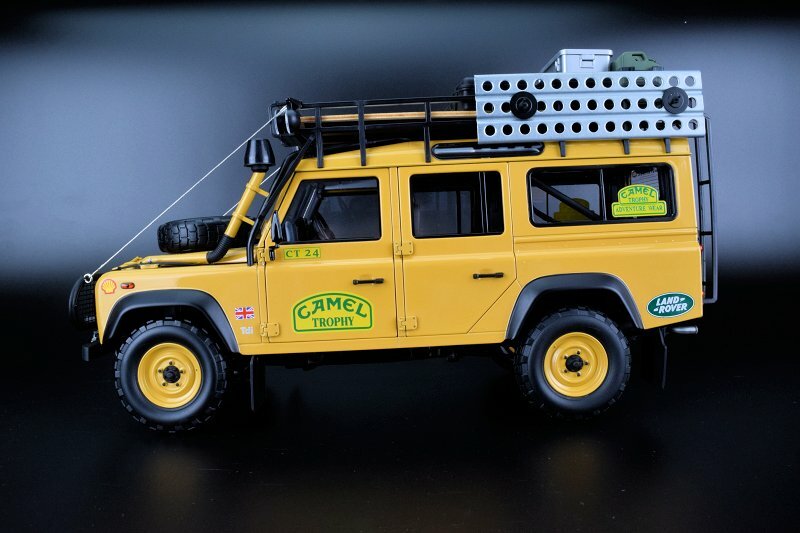 In fact, I felt a bit hit-and-miss with the Camel Trophy Defender, considering the excellent realism and precision from the Range Rover and G500 4×42. But look at the price of the model, and compare to the usual AUTOart Composite releases, and think, which is more valuable? Those “factual errors” aren’t very obvious to the average collectors, especially the mechanical ones. 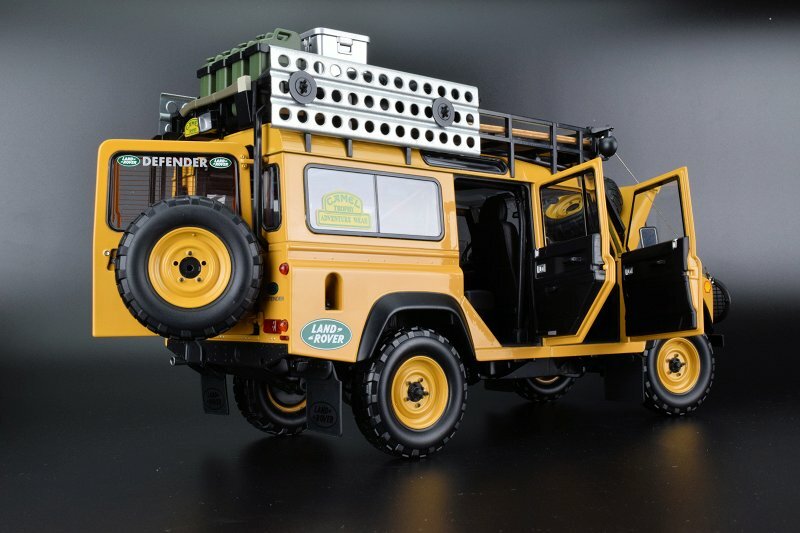 And once again, don’t forget that this model is basically derived from the Defender 110 Heritage, which is probably the debut release of Almost Real as an independent player, along with the Defender line-up. 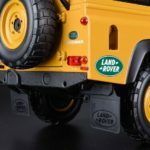 We don’t have all the answers, the accuracy angle with related information was provided by member’s of the Land Rover club. Are they 100% accurate, we don’t know. Based on images we studied we could not find definitive proof, but atlas we’re no authority on the brand. What we can say is the model is executed extremely well, and should satisfy most. As always not model is perfect. We do wish the R&D process would be more rigid, as with sending a man to the moon, but we all know that would layer in more costs. 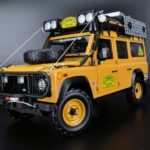 That’s why like I said, I’m not so sure about the “Camel Trophy” features such as decals and winches, since I also based my remarks on a real life example, but the mechanical parts like brakes & engines are not unique to Camel Trophy Defenders, that’s why I came to a conclusion. 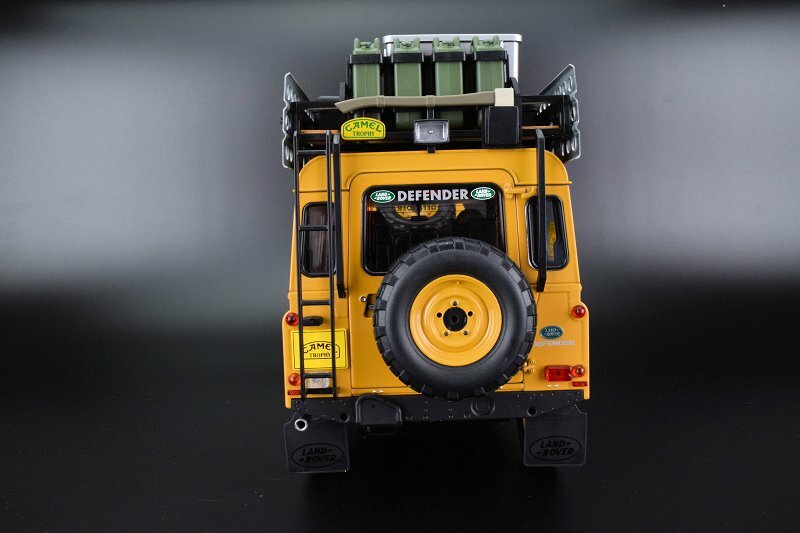 And as stated many times, the Defender line-up was Almost Real’s first release as an independent model brand, so I’m willing to overlook those mistakes. 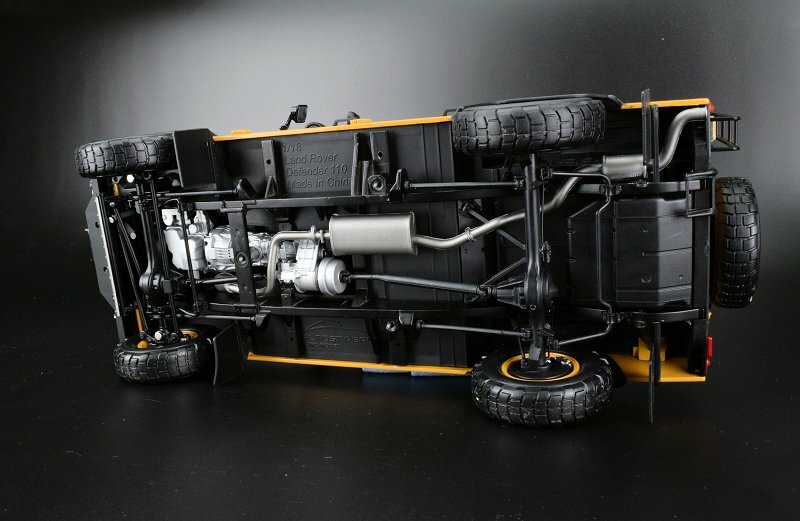 And yes, I agree with you that despite its (mostly small and hard to notice) flaws, the model is still an Almost Real at heart, and overall execution is top-notch and far above all recent AUTOart’s efforts, especially the Composite ones. I wonder how one can consider ian ideal model i– there are so many factual errors? 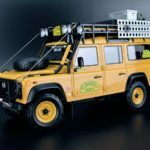 Let’s face it – the AR made a not bad model of the modern Defender, and then they just wanted to make more money and converted it into the version of the Camel Trophy. And the conversion was unprofessional. 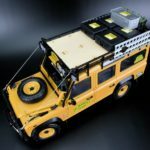 There are quite a few consultants of the CT-vehicles and many photos, clubs etc, and I don’t understand why the manufacturer did not turn to them for help. 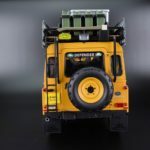 It’s hard to compare 1:18 and 1:43, but TSM’s CT Defender looks a lot more realistic than this AR-handcraft. 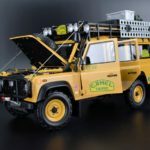 As always, Europe is served late with AR models, but the review makes me glad that I have pre-ordered the Camel Trophy 110 Land Rover, in the dirty version, which will most likely add further realism. 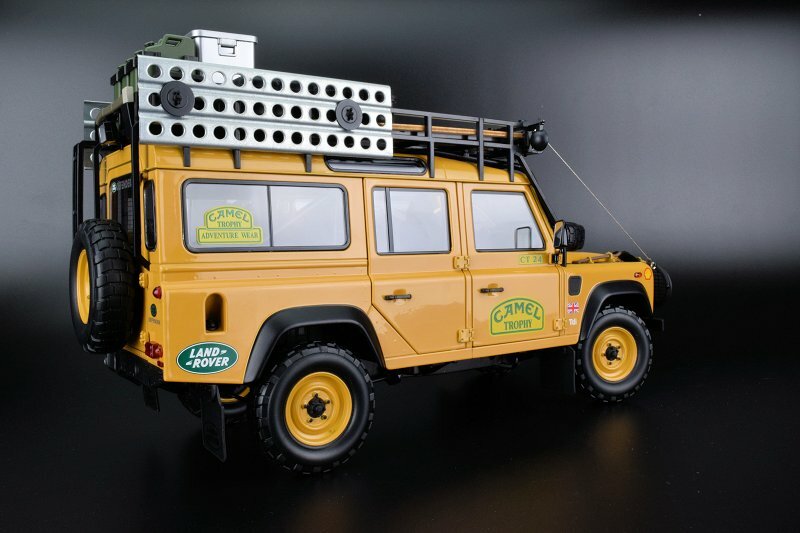 I pre-ordered mine via Minichamps, albeit the 90 version. A few of these brands have extensive collaborations so you can purchase 1 brand via another brand under the same partnership. 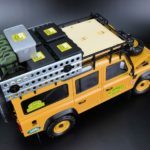 True, with Minichamps not being a big player as manufacturers in their own right anymore, they use their network to be importers and distributors for competitors like Kyosho and Almost Real. 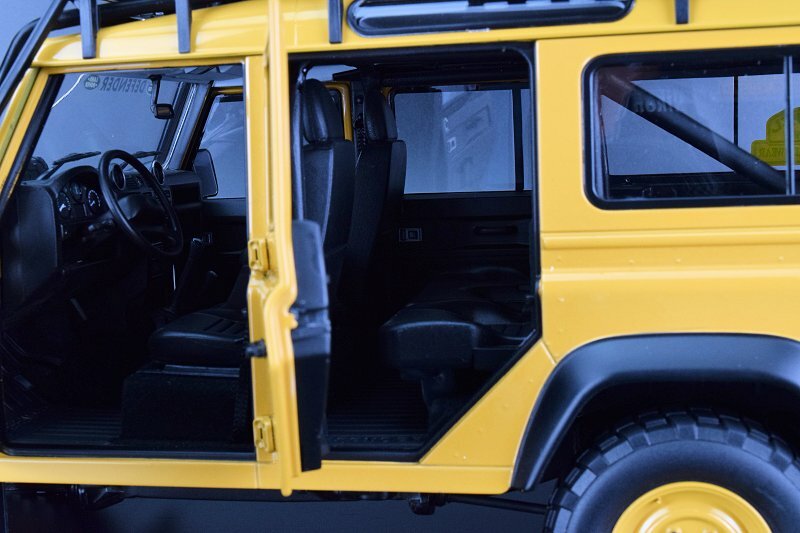 Actually all the shops in Europe get their AR models through Minichamps. But Minichamp´s website and customer service is abysmal. Even some of the shops have given up on trying to phone their “hot”line. I had to return my AR S-class (which by the way was forgotten here as a non-SUV although my review was published on DS) and it took them a week to reply to my emails, plus the shop I bought from sold it cheaper. That´s why I don´t recommend them. 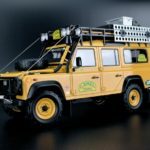 I’ve been looking some images of AR’s Land Rover Defender 90 Heritage in Green, and compared them with Kyosho ‘s same model. I think both are the same, but AR’s price is around US$40 Higher. Does anyone agree?